This innovative study of modern Turkey is the result of many years of ethnographic fieldwork and archival research. Michael Meeker expertly combines anthropological and historical methods to examine the transition from the Ottoman Empire to the Turkish Republic in a major region of the country, the eastern Black Sea coast. His most significant finding is that a state-oriented provincial oligarchy played a key role in successive programs of reform over the course of more than two hundred years of imperial and national history. As Meeker demonstrates, leading individuals backed by interpersonal networks determined the outcome of the modernizing process, first during the westernizing period of the Empire, then during the revolutionary period of the Republic. To understand how such a state-oriented provincial oligarchy was produced and reproduced along the eastern Black Sea coast, Meeker integrates a contemporary ethnographic study of public life in towns and villages with a historical study of official documents, consular reports, and travel narratives. 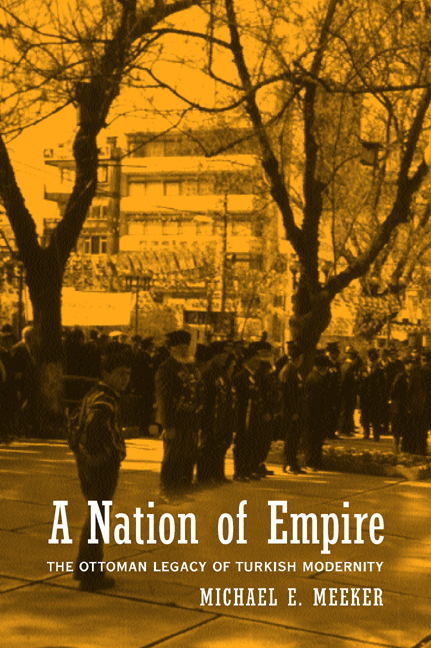 A Nation of Empire provides anthropologists, historians, and students of Eastern Europe and the Middle East with a new understanding of the complexities and contradictions of modern Turkish experience. Michael E. Meeker is Professor of Anthropology at the University of California, San Diego, and author of Literature and Violence in North Arabia (1979) and The Pastoral Son and the Spirit of Patriarchy (1989).